Bradonna Woodwork has been serving Southern Ontario's custom woodworking needs for the past 30 years. In that time we have experience in every aspect of woodworking. 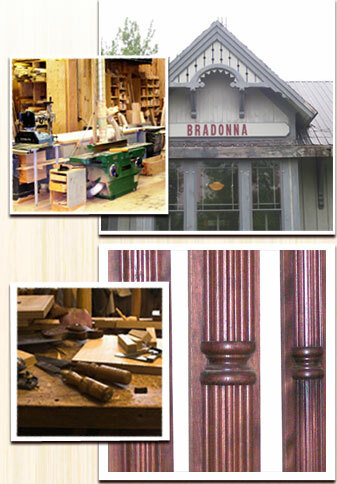 Below is a timeline of the history of Bradonna Woodwork. 1981 - After the cabinet shop that Brad worked at went bankrupt. Brad and his wife Donna started Bradonna Woodwork which provided custom built furniture at a reasonable price. 1989 - Brads brother Brett Eagen came to work with him. They purchased a Portable Sawmill and started cutting logs and drying and selling lumber. 1997 - Bradonna Woodwork upgraded once again building a second much larger shop and also buying a moulder. This allowed Bradonna to then start making different moldings, doors and stairs while still building custom furniture and cabinets. 2006 - The sawmill was sold and Bradonna stopped making furniture, cabinets, doors and stairs. Bradonna then went into a new industry, strictly supplying cabinet companies with moldings, turnings, corbels and other parts. Present - Today Bradonna still supplies cabinet companies with moldings, turnings, corbels as well as other products. Brad personally meets with his clientele making sure that all products from Bradonna Woodwork are of the highest quality.